A snapshot of my finances as of April 1, 2018. We were down 1.5% for a total of -$19,120.00 for the quarter. This includes my investment totals, specific stocks, category breakdowns and how I’m doing on the road to FI. Written by Adam on April 16, 2018. Updated April 24, 2019. 21 min read. Personal, featured, Financial Independence, Investing. 9 comments. At the end of every quarter, I share a snapshot of my current finances. This includes what I’m invested in, their values and the change over time. The goal in sharing this information is to show it’s possible to make money investing in super-simple ways without the need to watch the latest news. My hope is that people realize how easy it is to invest and take control of their own finances. Whether that’s reading a book on the topic, taking my free investing course, or looking at what others are doing and learning from that. When I learned to invest it was a combination of all of these, and I always wished more people shared the nitty-gritty of their own decision making. I hope this helps to highlight what I’m investing in, and get feedback from those more experienced than myself about ways I could improve. 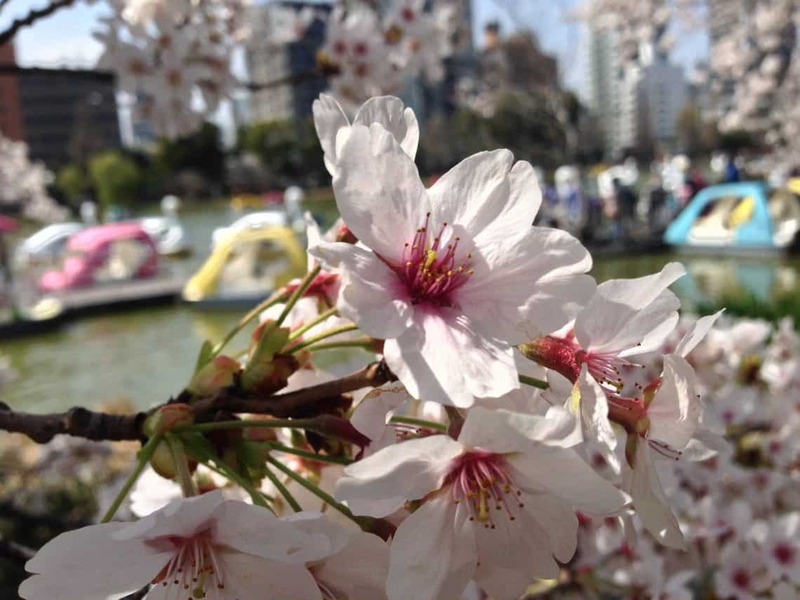 Picture of Cherry Blossoms taken in Ueno Park, Tokyo on our first trip to Japan. This wasn’t a great quarter for investments. The Dow had one of it’s largest decreases in years, cryptocurrencies went down by 66% and we’re at the beginning of a trade war with China. Throughout all this, my investments decreased by 1.59% from $1,221,774.00 to $1,202,654.00. Considering that my net worth went up 12.2% in Q4 2017 alone, I’m not too worried. The value would’ve gone down more in Q1, but we also invested quite a lot more during this time. 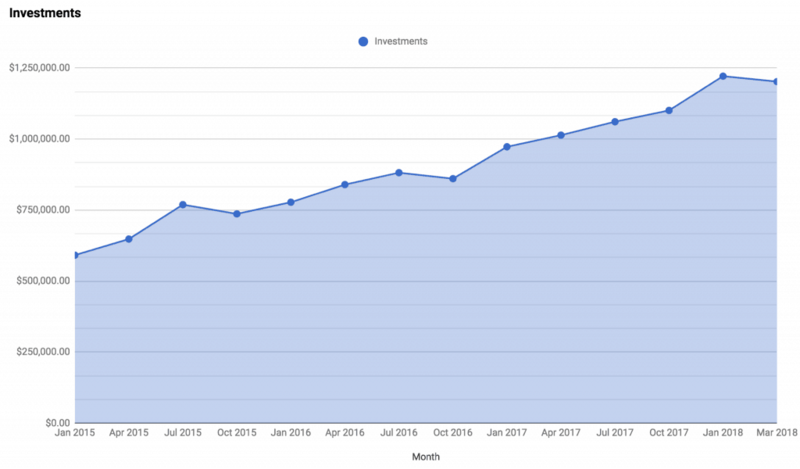 I don’t share how much I put into investments over the quarter (as that would pretty much be sharing my entire salary), but we’ve been trying to chip in as much as possible every month. This isn’t the first quarter that my investments have gone down. 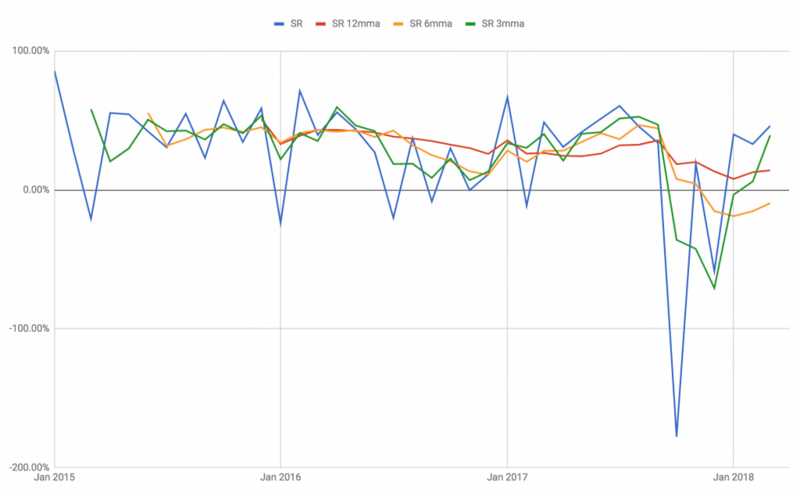 In the 39 months, I’ve been meticulously tracking my expenses, the account balance has been lower than a previous high for 13 of those months – 2 of them this quarter. The total value has gone down in 3 separate quarters as well. Even with down months making up a full 33% of all time, the trend line is what matters. We’ve been in one of the best bull markets the US has ever seen for the past 9 years, and even with the occasional month down, it’s been a steady climb north. One of the ways I learned how to invest was to read the Bogleheads forum. People share what they’re invested in and get feedback from others with more experience. This helped me to understand fees, diversification and more just by reading other peoples portfolios and the comments left by more educated members. This is one of the reasons why I share my numbers here as well. I’m not perfect, but I can always use another set of eyes who might see a place for improvement. I also want to share what’s worked and what hasn’t over time. There hasn’t been too much movement since Q4 for just about any fund on this list. The differences in value for most of them are due to increasing the amount going in rather than them actually rising. Vanguard Small-Cap Index: I only invested in this because I was bored with the Vanguard Total Stock Market and wanted more “control” over what I was invested in. If I were to sell it now I’d need to pay a bunch of taxes. If I had to do it again I’d just invest in Vanguard Total Stock Market and call it day. Wealthfront and Betterment: These are only opened as an experiment to write about them. I’m planning to sell everything and close the accounts in December. AAPL & TSLA: I bought these of these a few years ago as my speculative investments. Selling them now I’d need to pay taxes on them. I’m hoping to hold them a few more years and potentially sell them when I’m in a lower tax bracket. If I sold them now, I’d pay about $3,500 in taxes. I’ve been waiting for any other fund to go down in value in order to tax-loss harvest those gains and sell these. The markets have been steadily climbing lately though and I haven’t yet had a chance. Multiple Bond Funds: I’m in 4 different bond funds, but really only need to be in 1. The problem is that these are in different accounts – my 401k, my Roth IRA and a brokerage account. That means I need at least 3 different ones right there (the brokerage one could be the same technically, but this one is better for tax purposes). Looking at this today, I do think the “Total International Bond Index Admiral” is unneeded though, and just now decided to sell it. It’ll be gone in my next report. I’ve opened 3 new accounts since the first of the year. Two of these were the Betterment and Wealthfront accounts. These aren’t because I’m switching investing to robo-advisors, but because I wanted to be able to intelligently write about them. The most common question I get is “What do you think about robo-advisors like Wealthfront and Betterment?” and now I’ve started to learn enough to form a recommendation there. If you’re thinking about using these advisors, it’s worth reading to understand why you might pick one or the other (or none). Mrs. Minafi and I also opened a joint brokerage investment account. This is the account we stuff all our money after maxing out 401ks and Roth IRAs. At the moment it’s invested in bonds – just because that was the area that needed additional investment to bring our asset allocation back closer to our target allocation. These have gone waaay down. At their height, they were worth over $158,845.27. If I had sold at their height, I would have made over $100,000. Sure, $35,000 of that would’ve been taxes, but that’s still $65,000 more I’d have today if I sold. The reason I didn’t sell is that I’m not used to trying to time the market. I don’t like putting myself in a situation where I have to guess if a fund is at its highest. The fact that I didn’t sell when it was much higher, is proof of that. When assets are more than 5% off track (as a percentage of my entire portfolio), or 50% off track (as a percentage of that funds allocation target), buy or sell funds to bring it in line with my target – even if that sale has tax repercussions. With this framework, I would’ve sold 1/3 of my cryptocurrency when it reached 7.5% of my portfolio. It would have continued climbing, and I would’ve sold another 1/3. The end result would’ve been cashing out roughly $50k. This the absolute max I would’ve gained, but it’s an amount that I would’ve been very happy with. The downside is that I don’t want to feel the need to constantly monitor my investments. I love being able to ignore the financial world and check in every quarter to see how things are going. I don’t want to change this for one area. If this means I only rebalance quarterly in this way and miss out on huge spikes, so be it. Having this rule should help if I’m ever in a position like this again! This rule has an immediate impact today too – related to my asset allocation below. One of the common mistakes that investors make is not diversifying their investments. 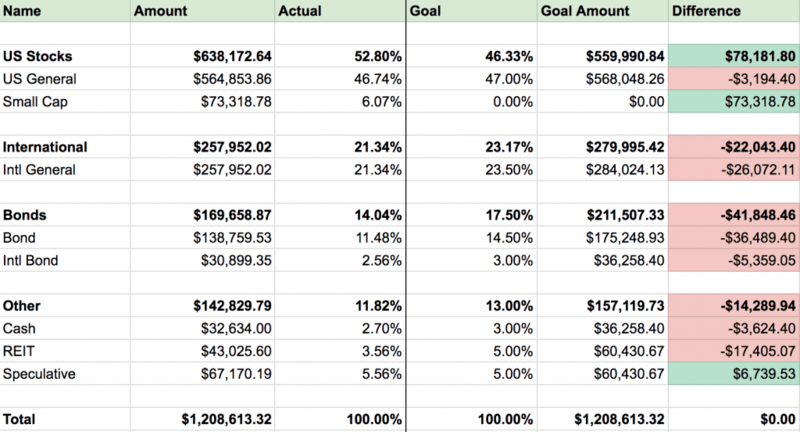 I use a spreadsheet to compare my current asset allocation with my desired allocation. Each quarter I update my holdings with everything and check out how the combined allocation plays out. Here’s a look at things as of early April 2018. My asset allocation as of early April 2018. Note: The value in this chart is slightly different than 4/1/2018 because this asset allocation was done a week into April. I wait a week to do this in order to give room for all credit card transactions to finalize before running numbers for the previous month. You can see from this that my US Stocks are the most out of balance – by about 6.5%. According to my new cryptocurrency rule, this means I should sell 1.5%, or about $20k and move it from stocks to bonds. For the last year, I haven’t been reinvesting my dividends from my small-cap fund, so I should be able to sell those and only incur long-term capital gains. That is the one and the only change I’ll be making to these investments! (besides continuing to invest more in the areas in red each month). I’m already investing in bonds for all money that comes in today – my 401k and our new joint brokerage account invest solely in bonds. Whenever possible, I put bonds in my tax-advantaged accounts, which is extremely important for tax purposes. 100% of my 401k is in bonds, and most of my Roth IRA as well. I also have a REIT fund in my Roth fund, because it had high turnover and dividends, which wreak havoc come tax time. There is no “tax-efficient REIT fund” either so that one needs to go in a tax-advantaged account. In my brokerage account, I invest in Vanguard Intermediate-Term Tax-Exempt Fund Investor Shares as my bond fund of choice. If I could, I would put everything in the Vanguard Total Bond Market Index Adm fund, since it has much lower fees – but MUCH lower turnover. They both distribute similar dividends, but the dividends from the “tax-exempt fund” are mostly tax-exempt. There is much lower turnover in the tax-exempt fund as well, which means that if there were taxes, they’d be “qualified dividends” which are taxed at your long-term capital gains rate – rather than “unqualified dividends” which are taxed at your ordinary tax rate. The tl;dr of the last paragraph is that if you have a tax-advantaged account invest in Vanguard Total Bond Market Index Adm fund. If you’re investing in a taxable account, consider one of Vanguards tax-efficient bond funds. Last quarter has been very rocky from a spending standpoint. Our savings rate for the last quarter was 23.11% – if you exclude profits from the sale of the house, it was -52% (yes, that’s a negative sign). For that quarter, a lot of the spending was for things we’d been saving up for – preparing our house for the sale, pre-paying for a honeymoon in 2018, eating at some restaurants for the last time before we moved and hanging out with friends before we left Orlando. For 2018, we’re starting out in a better spot. Our 3 month moving average for savings was 40% for the quarter, but part of that was thanks to a nice year-end bonus which helped boost things a little. Here’s a look at all the categories broken down for the year. I use Personal Capital to track every expense, the value of every fund, income and a do a whole lot more. If you’re looking for one tool to do everything, I’d recommend checking it out (it’s free). A few of these expenses are on the large side this quarter. Home – $6,093. This breaks down to ~$4,000 for rent and another $2,000 for home improvement, and general household goods. This includes our lovely new guest room couch/bed, which was a result of our last major Ikea trip for a long time. Our $2k/month rent is steep, but that does come with a few services bundled – water, cable, internet, 2 parking spots, pet rent, and a storage unit right outside our apartment. We only paid rent twice in Q1 since we paid January’s rent in December. Transportation – $2,185. This was a lot higher than I expected. This is almost entirely Mrs. Minafi’s car + insurance. We’ve discussed some alternatives around this – going down to one car would greatly reduce this. We’ll keep thinking about this one and see. Entertainment – $895. Entertainment includes all date nights, as well as alcohol and bars. Half of this amount was in the usual entertainment side (movies, netflix, spotify, hulu) while the entire other half was alcohol & bars. Fewer bars and more just picking up wine, beer or liquor accounted for about $400 of this amount alone. This is an area I’d like to cut down, and it’s a part of my personal Q2 Goals. Travel & Luxuries – $5,411. This is a pretty crazy large amount. $3,000 of it was pre-booking trips to Scotland for our August trip out there. It hurts to spend that much on our airline tickets. We bit the bullet and bought them because there’s only 1 direct flight from Salt Lake City to London on the day we wanted, and if we didn’t get it we’d have to spend quite a few more hours traveling or change our dates. Another $1,200 of it was spent on custom suits for Mrs. Minafi and me while in Vietnam. Mrs. Minafi’s looks amazing, but I have a bit of buyers remorse on mine. I don’t wear suits often enough, and I admit I let the idea of a “good deal” on a suit overpower my natural reaction to defer a decision until I need it. The last $1,200 of this expense was spending during our Southeast Asia trip. This was mostly restaurants, cash from ATMs for small things and taxis. Looking at the spending now, about 25% of that amount was spent in the airports alone (!). This is an area I want to do better at by preparing a little more ahead of time. Food – $2,706, or $900/month. $900/month in food for 2 people seems steep, but doing the math that’s only $15 a day in food. That does include all groceries ($1,272), restaurants ($1,288) and coffee/dessert places ($146). I’m happy with this amount for this quarter. It’s very close to my target for the year. I suspect one reason it’s under is that I’ve switched to eating breakfast and lunch provided by my work – which surely lowers this amount a bunch. I’m also not working remotely as much, which means less time spent in coffee shops. Education & Career – $231. Not too much interesting here. Dropbox renewal, some domains, Amazon hosting for other websites, occasional software for personal use, Adobe subscription. Personal Care – $1,088. Much higher than usual on this one. This number includes a few things I bucketed in the “fitness” category – CrossFit, hiking spikes and an AllTrails subscription. Those alone accounted for $650 of this amount. The rest included a doctor visit or two, some new snow boots, and a pair of haircuts. Pets – $1,220. The biggest growth of all! Last year we spent less than this for the entire 12 months. Usually, when we travel we leave our pup with Mrs. Minafi’s mom. Now though, we need to board her overnight. Add to that the need to get her checked by a vet beforehand and you have a large bill for a very small time. Spending $17k a quarter puts me on pace to spend $69k a year. This would be better than last year ($73k), but still higher than I’d like. One of the reasons why expenses have increased is because I’ve included more joint expenses between Mrs. Minafi and I. We haven’t completely joined our expenses yet, so this spending doesn’t include some of her expenses – lunch, clothes, luxuries and personal. As much as I love having a snapshot on total spending for the two of us, having a rough estimate based on my math + her credit card payments are enough to ballpark this. I don’t plan to include all of her personal expenses here, and instead focus on ones that are in the me/us category + very large ones for us both (like cars). Transportation – Going down to 1 car would save us a lot of money. Pets – If we can find some friends to look after our dog when we travel, we can save a bunch here. Travel – We paid the largest single costs of travel for the entire year this quarter. We’ll still have 3 weeks of hotels this year (Scotland, San Francisco, South Utah, Orlando) along with some flights (hopefully free using Southwest). I anticipate this being the largest category outside of “home” – but I’m happy to pay for those experiences! I’m not expecting to have any other large home furnishing or electronic purchases this year. My 6-year-old laptop and 4-year-old iPhone are holding up – and now that we have a couch and a guest bed we’re good on the homefront. There is one large expense I’m anticipating this year: changing cars. I’ve been trying to hike more, but a number of places are impassable without a 4-wheel drive vehicle. When I wanted to go skiing earlier this year, I needed to park at the base of the mountain and take a bus up/down. Some trails are inaccessible without a car as well. As we want to explore more of Utah, having a car that can reach ski resorts and trailheads becomes more important. This isn’t going to be good. I’ve been using savings rate as a lifestyle inflation canary for a while. Last quarter that canary is in some serious trouble. My existing SR graph is thrown so much out of whack by this spending that I needed to readjust my formula. Trailing 12 months SR is a better way of looking at this. Savings rate over time with trailing 6-month and 12-month rates. The 3-month, 6-month, and 12-month rates are based on the total amount spent and earned over those periods. Previously, I was averaging the actual rates to normalize things. After my single -177% month, that wasn’t going to work anymore. Luckily switching to this formula looks much cleaner. I did decide to exclude windfalls in these numbers as well. Things like the sale of a business, selling stocks or investments, dividends and selling my house aren’t listed here. This is entirely based on how much I earned through sustainable methods + the occasional small addition from selling something on ebay. There’s also no profit from this blog, so that’s not a factor in these numbers (well, not in a positive direction at least). The 401k contributions are factored into both the numerator and the denominator in this formula. It comes down to “total invested” divided by “total earned”. The “total invested” one is a bit more complex than that though since I don’t always invest every cent in a given month. Instead, I base my savings rate on the total amount I could have invested. With a yearly spending of $73,420.92/yr, that would mean I’d need $1,835,523 to be FI at 4%. With my $1.2m investments I’m still a few years away. According to my financial independence calculator, I’m roughly 4 years away from FI – at age 39 years 10 months. If I can lower my spending by 10%, I’ll be FI 1 year, 2 months earlier. If Minafi can replace 10% of my income I’ll be FI 1 year earlier. If I can do both, I’d be FI in 1 year, 8 months – that’s January 2020! With the current trade war being started with China, there is a large risk right now of markets decreasing. I’ll continue to invest and continue to hold – nothing will change there – but I wouldn’t be surprised if markets take enough of a dive to impact these numbers. In other words, I’m not making any plans based on these dates – they’re all just optimistic hypotheticals. There is one variable in this situation though: Minafi! I’ve started tracking and sharing Minafi’s Income & Expenses monthly. Minafi today is a costly hobby, but I’m curious what it’ll become over the next few years. Almost a year in and I still enjoy writing. We’ll see how things go! We did a lot in the first three months of this year. Two weeks in Southeast Asia, spending the first full month in our place and settling into our new offices and workflows were all new. Mrs. Minafi and I still turn to each other and realize that it doesn’t yet feel completely real that we’ve moved away from Orlando. When we were flying back from our trip, there was a small part of me that was expecting us to land in Florida and see that familiar airport. Even though it’s completely different, I’m loving Utah. I’ve been trying to go for more hikes around the area (one of my Q2 goals! ), and they each one has been amazing and memorable in different ways. Investment wise, the biggest takeaway was adding one more personal rule about how I rebalance. Up until this quarter, I’ve been able to get by rebalancing by only buying new things, or selling when it was tax-efficient. Adding another rule for myself helps clarify my strategy going forward. Having invested through 2008 and the Great Recession, losing out on gains is bad, but nowhere near as bad as seeing my entire account value go down by half over months. I’ll keep investing more money whenever I have it – not timing the market or waiting for a correction. How did your investments do in the first 3 months of the year? Did you spend more or less than what you wanted? Eek, yeah sounds like a very similar position. I’m in the wait and see boat too. I’m cautiously optimistic that things will go up again this year. So you plan to get a 4-wheel ? What model will you opt for? Why? Still need to do more research on this one and test drive some vehicles. Anything would, hopefully, be smallish, on the cheap side and with good gas mileage. Subaru’s and Mini Crosstrek are 2 on my mind now. This area is all new to me though. Have any recommendations? I am not all in on cryptocurrencies or even certain they will work, but since I don’t need the money, I plan to hold my crypto positions. I’m betting on the blockchain protocols, rather than the idea of digital currency as a store of value or replacing fiat currency. They could very well go to $0, but I am optimistic that one or more blockchains will evolve into more meaningful applications. We’re still in the early development stages with the best programmers in the world working on them, so we shall see. I’m in the same boat on those. I’ll be curious to see who the winners are in the blockchain world. Besides as a “store of value”, there hasn’t been a killer app for crypto yet. Why not sell some of your crypto and harvest those losses to offset the gains from selling Tesla and Apple right now? It sounds like you’re letting the tax dog wag the investment tail, as they say. You’ve already made up your mind that you’re going to sell the stocks, which means you don’t really need/want them. So sell them but manage the tax consequences by selling the same amount of crypto for losses at the same time. Then you will have $0 tax if you create $X of gains from sale of stock as you do $X of losses in crypto. Without realizing it, I believe you’re continuing to make the same mistake with AAPL/TSLA and Crypto that you already did with crypto last year–that is, market timing. You’re hoping the crypto goes back up this year (news flash: it might not. Or it might even go down lower. It has at certain points already this year). At the same time, you’re hoping the AAPL and TSLA stock stays where it is now for another few years (or go higher) until you sell it. News flash: what if it goes lower over the next few years? Getting rid of your individual stocks and crypto has the additional benefit of simplifying your portfolio further by getting rid of those pesky speculations and allows you to get back to the business of investing. Having a simpler portfolio also will be easier for Mrs. Minafi to manage in the event something happens to you (hopefully not, but this is what financial planning is all about, right?). What could be better than making your finances easier for your significant other! Keep us updated. Nice blog Adam! Why not sell some of your crypto and harvest those losses to offset the gains from selling Tesla and Apple right now? I think you’re right on this one. I’d been hesitant to sell because of taxes, but I think I’m letting complacency get to me. This is actually great feedback. Between writing this post and now, I started to sell some of my AAPL/TSLA to simplify things too. I hadn’t heard that term (“tax dog wag the investment tail”) but it does make sense. I would like to simplify things and sell these, so I think that’ll be in the cards in the near future. I’m glad the comment helped. After I posted I immediately thought “Wait, maybe Adam’s crypto is still up from where he purchased it, so there wouldn’t be any losses!” D’oh! My bad. Anyway crypto has taken some dips earlier this year. Maybe still not enough to create losses (I don’t know your cost basis) but something to follow I suppose. Finally, I made another oopsie. The correct phrase is “Don’t let the tax tail wag the investment dog”, as opposed to what I wrote originally.